The evolutionist will claim that the presence of many individual species proves evolution. This shallow statement is devoid of reason, logic and scientific proof. Evolutionists line up pictures of similar-looking species and claim they evolved one from another. The human "family tree" is an example of this flawed theory. Petrified skulls and bones exist from hundreds of species of extinct monkeys and apes. Evolutionists line up the most promising choices to present a gradual progression from monkey to modern man. They simply fill in the big gaps with make-believe creatures to fit the picture. This procedure can be done with humans only because there are many extinct monkey and ape species. They never do this with giraffes, elephants or the Platypus. The pictures are placed in all of the textbooks that evolutionists use to teach kids this nonsense. The pictures are simply a grouping of individual species that does not prove evolution. They’re trying to claim that scientists simply jumble similar looking fossils together and call it evolution. As usual, this claim is full of false statements and ignorance. You would’ve thought that if they really wanted to refute evolution, they should at least do a little research. Let us see how easy it is to refute them. The Earth’s crust is divided into many layers known as strata(singular: stratum). Every stratum can be distinguished from each other through its own unique characteristics. A few examples are the Devonian, Carboniferous, Permian, Triassic strata. The Law of Superposition states that sedimentary layers are deposited in a time sequence, with the oldest on the bottom and the youngest on the top. However, sometimes the sequence is changed as a result of thrust faults. There are multiple methods to determine the age of strata, namely: radiometric dating thermoluminescence dating and incremental dating. Through the combination of these theories, we can create the geologic time scale for the Earth. The theory of evolution predicts that we evolved from earlier, simpler life forms into later, complex life forms, and this is exactly the case. The current fossil evidence shows an increase in complexity from the first microorganisms which were found to be 3.5 billion years old straight up to today. Older strata usually contains less diverse and smaller number of fossils, while older strata houses complex and more abundant fossils, save for the multiple mass extinctions that occurred. This is known as the Principle of Faunal Succession and strongly supports the theory of evolution. In other words, a species below the stratum of another species couldn’t have evolved from it. Human history is too short to be visible on this timescale. Why do we find whales in the deserts? Why was Tiktaalik found in the Arctic Circle? And why are similar species distributed unevenly all over the world? The answer is continental drift. This theory states that the Earth’s continents were once joined together in a super-continent called Pangaea in the Permian period. Pangaea later broke off in the Jurassic period to form Laurasia to the north and Gondwana at the south. Both of these continents would later separate off again and finally arrive at the places they are today. 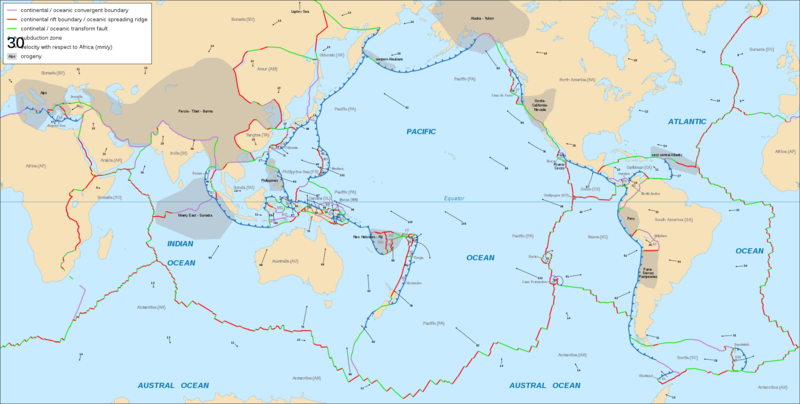 The movement of continents are explained in plate tectonics. The surface of the Earth consists of lithospheric plates that moved through geological time, resulting in the modern-day position of the continents. 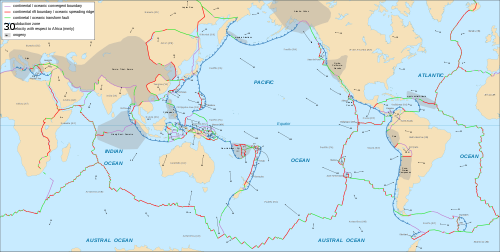 The continents as we know it are only elevated areas of the the lithospheric plates. The lithospheric plates consist of the continental and oceanic crust plus the upper mantle. The plates lie upon a fluid layer of lava known as the asthenosphere, which is responsible for the movement of the plates. By collaborating the our knowledge of continental drift with molecular biology, we can determine where fossils belong in the phylogenetic tree, but let’s postpone this matter. We can find a lot of anatomical similarities between groups of living things. For example, all vertebrates share a backbone, all flowers have petals, stigma, anthers etc. The difference is that they vary in form and look, but the overall pattern remains the same. The adaptation of groups of animals that share homologous structures (same form, different function) to fit their environment is known as adaptive radiation. The gradual spreading of organisms with adaptive radiation is known as divergent evolution. As individuals or groups which share more features in common are supposed to have diverged earlier from a common ancestor, comparative anatomists look for homologous structures in animals to determine how closely related are they. 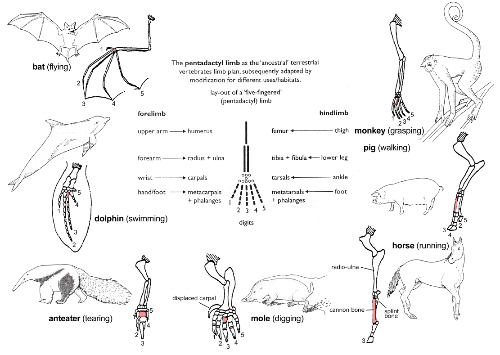 The comparison of homologous structures allowed scientists to show that bats evolved from shrew-like creatures, instead of birds (Leviticus 11:13-19). The concept of homologous structures is presented here. 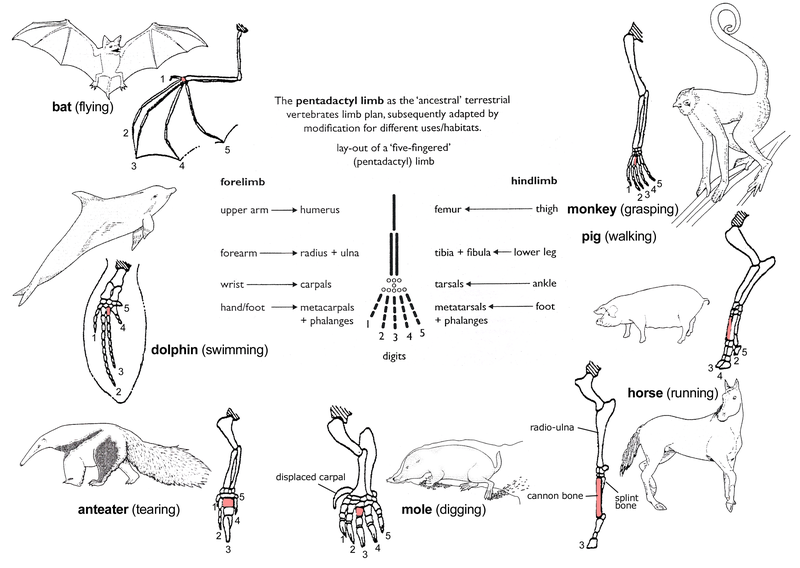 All mammals share the same pentadactyl pattern for their limbs, yet have adapted it for different uses. Vestigial structures are one of the strongest evidence for evolution. A vestigial structure is a homologous structure that is underdeveloped and useless or adapted for different uses. There are plenty of vestigial structures found in organisms, be it extinct or alive. A vestigial structure suggests that the environment the species lived in no longer had selection pressures on that structure, and could focus on other parts. A lot of skeletons show traits of vestigiality, such as wings on flightless birds, the coccyx of apes etc. The best example is the hind limbs of whales and other cetaceans. 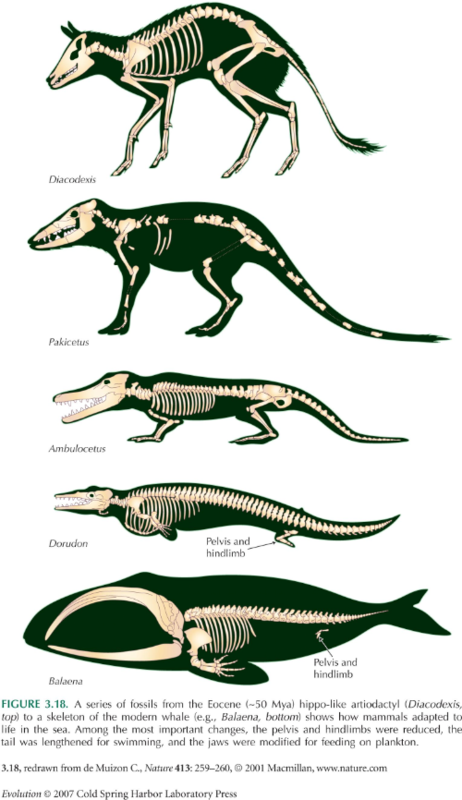 The appearance of vestigial pentadactyl limbs in cetaceans is strong evidence that whales were not simply created, but evolved from a earlier tetrapod that lost functionality for its legs. As Douglas Futuyma said, vestigial structures do not make sense without evolution. Why would a creator create such structures cannot be explained by creationists. One of the ways to determine whale evolution is the vestigiality of its hind limbs. Differences between homologous molecules can be quantified and expressed as, for example, the number of nucleotides and amino acids that have changed. We can use the differences between homologous molecules to determine the rate of evolutionary change much more precisely than we can simply through the phenotypes of the genes. 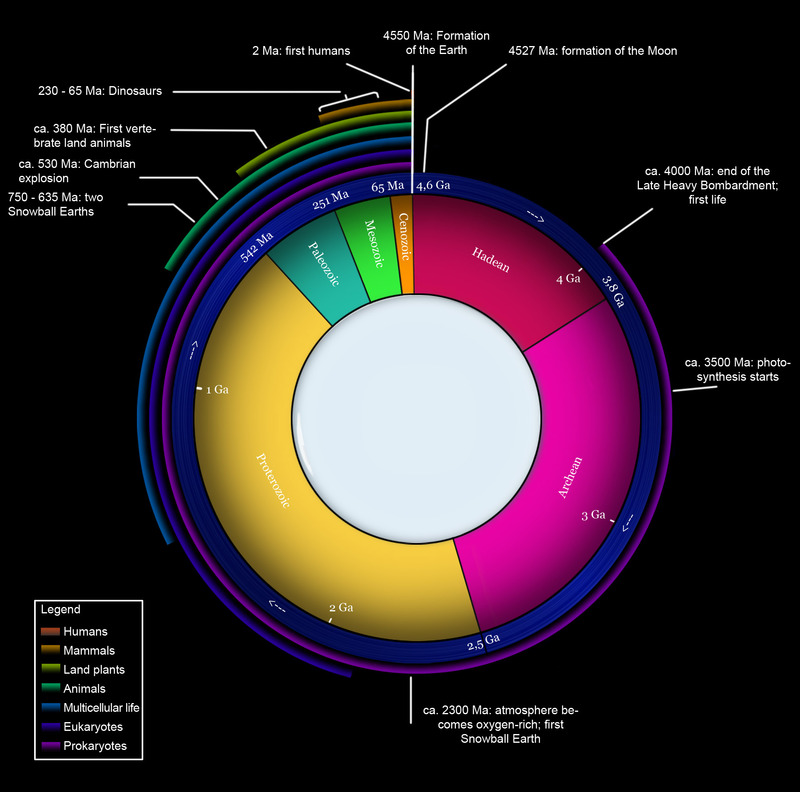 In the 1960s, it was discovered that the the number of differences between amino acid sequences of the proteins of different species was proportional to the time they were predicted to diverge from a common ancestor. The more differences in the amino acid sequences, the longer the divergence. Since the rate of change was identical for every species, we can use not only update the sequence of branching events in a phylogenetic tree, but the time when it occurred. But how reliable is this method, you ask? Of course, the molecular clock is not expected to work like our watches do, which measures time accurately based on standard units. Instead, a similar analogy can be found in radiometric dating. Radiometric dating is founded on the observation that the half-life of same types of elements are same, while the molecular clock is based upon the observation that the difference between homologous molecules increase proportionally to the time since divergence. Although scientists have found out that the molecular clock is more erratic than other clocks, such as radiometric dating, it is not too large. To increase accuracy, a large number of proteins are compared to determine the average rate of evolutionary change. The more differences, the more accurate the clock. This clock is later collaborated with outside sources (the fossil record, continental drift) and to determine its accuracy. Yet even with such efforts to minimize error, the clock is still found to be estimate dates older when compared with other methods. Nevertheless, the molecular clock still provides very compelling evidence for evolution, and so far it has been very consistent with other methods. So how does this contribute to classification of fossils, anyway? Well, we can determine whether a fossil is truly a member of a specific genus(or class, species, etc.) So if we find a humanoid that is 25 million years old in Australia, we can safely conclude that it must be unrelated to the Homo genus, since the molecular clock puts the divergence of the Homo genus from chimps at around 6 million years ago, and continental drift also says otherwise. In this post, it has been made very clear that we do have a lot of methods to determine where a fossil belongs, and whether it really represents a transition between earlier and older species. It is certainly not just, “Well I think this is the best guess”. I may have missed other methods of determining a fossil’s place in the phylogenetic tree, and if that is so, any comments would be greatly appreciated. By the way, you have shown your ignorance again, creationists. And yes, in my next post, your alleged claims that all those beautiful fossils such as Australopithecus, Tiktaalik, Archaeopteryx etc. cannot support evolution will be utterly destroyed. At the meantime, take your time and do a little research, please. Futuyma, D. J. (1995). Science on Trial: The Case for Evolution. Sunderland, MA: Sinauer Associates Inc.. pp. 49. ISBN 0878931848. Darren, my good friend, your blog almost complete and your explaination enough, so keep on, man! i wish you a merry christmas !